A few months ago we were approached by an interiors consultant called Jaye Pearce for a rather special project, her wedding dress. She had decided she wanted something different and being a creative person, decided that she was going to have a little more of a hand in what her gown would look like than just choosing it, she was going to design it. This is the point where we starting discussing the possibilities for making her design a reality so Jaye presented us with a detailed sketch of the design she wanted for the top of her outfit which was going to be in a very sheer fabric with delicate beadwork. The design comprised of deco inspired fans complimenting the contours of the body, a scattering of stars and romantic cabbage roses surrounded by daisies. 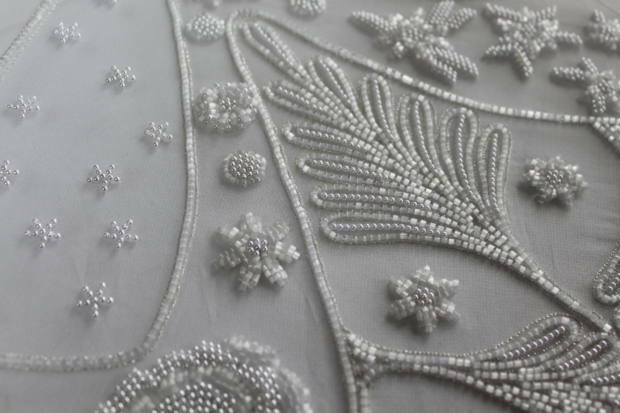 The design had a quite whimsical nature with all its delicate components so to reflect this is was decided that the beads would be a combination of seed pearls and satin cut frosted glass beads in the traditional ivory tone. This was highlighted with very fine silver stitched details which offset the lining which was in a vintage blush pink. Jaye has very kindly sent us some pictures from her big day where you can see the full outfit in all its splendour and so you can see the beading how it is meant to be seen. And here’s the lady herself, congratulations to the happy couple for all the ladies at Hawthorne & Heaney!